Make the most out of your investment in and enjoyment of Matcha with these essential tools to whip up the perfect lump free matcha. Includes: - Bamboo Tea Whisk (Chasen) in a clear tube - Whisk Holder (Kuse Naoshi) - Hooked Bamboo Scoop (Chashaku) - Bamboo Tea Spoon Bamboo is sourced from certified factories that provide fair and good working conditions for their employees - and a large tray to hold everything. 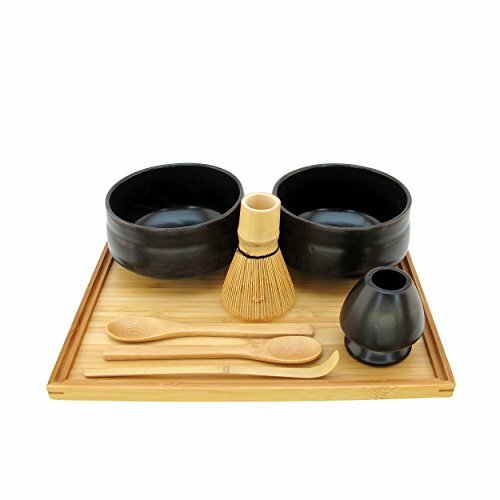 This set will help you whip up the perfect cup of lump free Matcha and to maximize enjoyment of your home-made matcha. Details: With 2 Bowls, you can make more matcha tea or teach a friend. Bamboo matcha tea whisk comes in a clear display tube. With the addition of the ceramic rest, you can prolong the life of your whist by maintaining it in good shape and preventing mold. The Bamboo Chasaku is great for scooping out the perfect amount of matcha powder while the bamboo teaspoons are great addition to have on hand. Large tray is great for holding everything together.